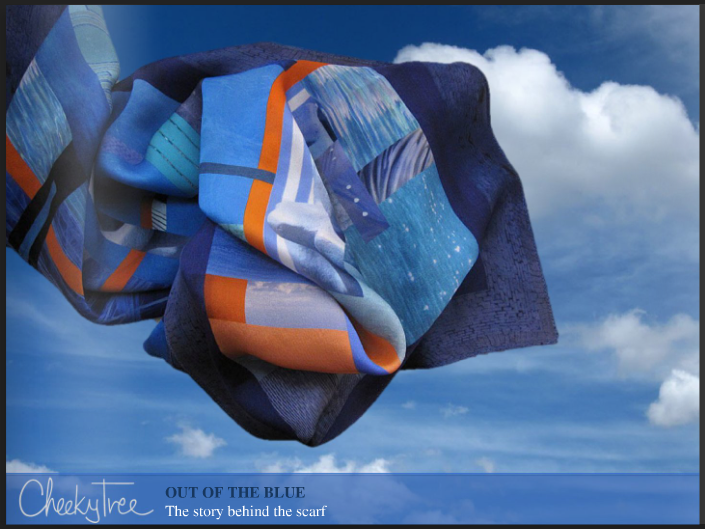 This entry was posted in art, fashion and tagged creative process, photo collage, scarves, textile design by Lila Cheekytree. Bookmark the permalink. Despite knowing it was a collage I had no idea (except for the canoes) about the stories behind the pictures!! That was a great” look see” at your travels.I was worried you weren’t going to “publish” this week,and I was really missing it. Thanks Diana. Yes, I was a little late posting my blog this week, as I had some new technology to learn to make the online magazine. Glad you like it. How about a written thumbs up? I’ll take it! Thanks so much Carol. Thanks Suzannah. Yes, I’d like to create more of these. This format just fit for the photo-collage design, I’ll have to brainstorm new ways to tell the stories about my other scarves. A fun challenge! Stay tuned. Brilliant idea to share your inspirations! It makes the entire scarf more personal and significant. Good job! Thanks Wanda. Glad you enjoyed it. Thanks for the thumbs up Kim! Fantastic! Very inspiring! How about ……umm A post card with those pictures included with the scarf to challenge the persn to find them in THEIR NEW SCARF! The story truly captures me! You get two thumbs up from me! I agree…you should let us know the “history” of all your scarves….it’s so fascinating. Converting all that we experience, to art…and sharing it…is our purpose on this planet. Thanks for the reminder. a thumbs up is obvious-keep on travelling..
there’s a scarf in them there hills. There is a little rectangle that looks like sun sparkling on water . . . .is that Moraine Lake? I had no idea this beautiful scarf had came from so many amazing experiences. You are so talented Lila! Smooch. Yes you’re right Sue, that image of the amazing sparkling water was taken at Moraine Lake. This is beautiful. What a great way to add another layer of inspiration to something already inspiring. This is really cool. I would never have recognized the pool at the Bellagio but it makes the scarf more interesting when you see the inspiration behind it. It would be nice to have the explanation accompany the scarf so that the person who purchases it can have the pleasure of knowing too. Thanks Pat, will definitely consider that. Love the scarf. Love the story. Please continue to share the inspiration behind your scarves. Thanks for the suggestion Elizabeth! Glad you approve.